Save time! Use the Catch Up® resources at your fingertips! 6th September 2018 - Save time! Use the Catch Up® resources at your fingertips! As you get underway with your interventions this term, save yourself time by remembering to use the supporting resources already available to you, to help you get Catch Up® Literacy and/or Catch Up® Numeracy up and running as quickly as possible in your setting. Simply log in to your user account on the Catch Up® website to access a wide range of resources, including a number of items for you to download and distribute to parents and carers, such as a letter and leaflet to let them know about Catch Up®, and a separate range of leaflets containing useful hints and tips on how they can help their child with reading or numeracy. Your user account also contains a number of resources for the person managing the interventions in your setting. For example, there is a set of ready-to-use management proformas, along with a series of training videos based on our 10-point Coordinator action plan. These videos take you through how to introduce, support and monitor the interventions in your school using the management proformas and tools available, which will not only save you time but will also give you the best chance of embedding our successful, effective interventions. Remember to check that your school has been given access to the Catch Up® Progress Reporting Tool! This will enable you to easily record and track the progress of your learners, and your nominated Catch Up® Coordinator will be able to produce reports for both individual learners, and groups of learners. 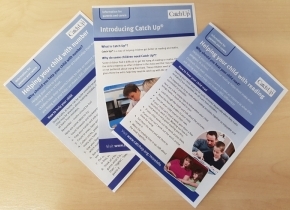 At Catch Up®, we want to make it as easy as possible for you to make a difference for your struggling learners. We are here to help, so please feel free to contact us with any queries!